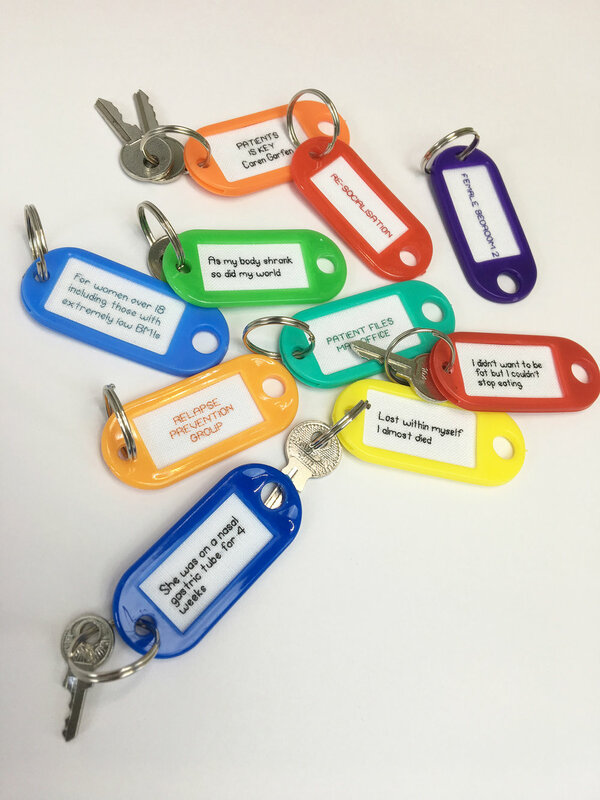 A key safe overfilled with keys with multi-coloured tags was hanging in the office of an eating disorder clinic and became the inspiration for Patients is Key. In this artwork, each tag has hand stitched words which represent being both a patient and a carer within the healthcare system. The coloured tags have been laid out in the same format as a Body Mass Index chart. The keys represent the physicality of the patient being locked into a clinic for their safety, and also being locked into the mental torture of an eating disorder. Magnetic noticeboard on front of key safe with photographs of young people who have lost their lives due to anorexia nervosa…models, a gymnast, singers, and an author. Butterfly magnets had been found abandoned in a bedroom of an eating disorder clinic.